How refreshing to enjoy folk music in a non-high stakes environment. Stopping by the Tuckerbox Café on Friday night, I grabbed a tall latte, took a seat close to where Phil Singer and Laurianna Jordan were harmonizing, and relaxed. 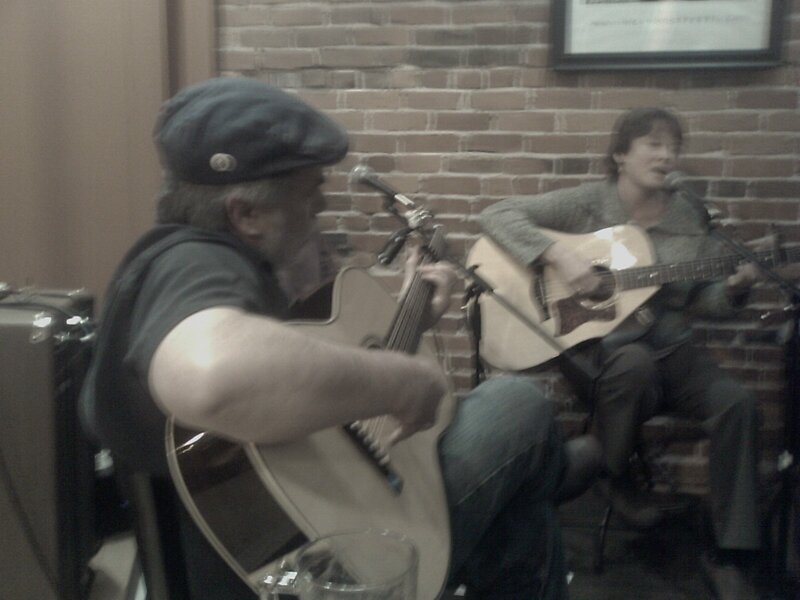 The pair worked through a few of Phil’s songs, which recall the music of classic folkies like Pete Seeger and Phil Ochs. All the while, a steady stream of friends, family and curiosity-seekers milled in, quickly filing the street-facing performance space, then the large seating area adjacent to the food/coffee counter. Then Marianna played solo – too bad I wasn’t able to hear all of her set, but what I did catch was quite enjoyable, including one original about love gone wrong. A moment of perfect synchronicity occurred at the end of McKim’s rendition of Jean Ritchie’s “The L & N Don’t Stop Here Any More,” when a train whistle moaned as if on cue. It’s just the sort of scene I was counting on when I wrote about Tuckerbox earlier this week. It’s not Club 47, but it’s a pleasure to be able to actually listen without the music getting drowned in conversation. The only noise came from behind the counter (the espresso machine sounds like a prop from ”Brazil”). People mostly paid attention, and those that were talking did so in hushed tones. To my delight, it was mostly about the music. The Tuckerbox Folk Series happens every Friday from 6-8 PM at Tuckerbox Café, located in White River Junction at the corner of North Main and South Main.